At 8:00am on Tuesday 14 October 1913 a huge explosion rocked the tiny town of Senghenydd, to the north of Caerphilly. It came from the coal mine belonging to the Universal Colliery, the most significant employer in the area, and before the hour was out it was clear to everyone, miners and their families alike, that what had happened was a disaster of major proportions. The explosion, and subsequent release of poisonous gas, killed 439 miners, making the Senghenydd pit disaster the most lethal and tragic mining disaster in British history. On that morning nearly 950 men had been working below ground, and many of them were killed or injured before they even knew what was happening. The Universal Steam Coal Company (a subsidiary of Lewis Merthyr Consolidated Collieries) had sunk the first shaft at Senghenydd in 1891, full production using two shafts – the Lancaster and York – beginning five years later. In the years leading up to World War One there was an unprecedented demand for Welsh coal, most of it being used to fuel the battleships of the Royal Navy. And the Universal, privately owned and privately run, like all of the other South Wales collieries, prospered. The explosion that brought about the disaster was probably caused by an electrical spark from something like the electric signalling gear igniting methane gas, firedamp as it was known. As if that wasn’t enough, the firedamp explosion caused coal dust lying on the floor of the mine to rise and this also caught fire and exploded in a gigantic roar. The shock wave promptly caused more coal dust to rise into the air and this also then ignited. In effect, what happened was a series of self-fueling explosions. The explosions were so violent that the cage of the Lancaster pit was even blown back up the shaft to wedge in the pithead winding gear. A banksman standing close by was decapitated by a piece of flying wood. The fires spread through most of the underground workings, quickly followed by afterdamp. These were gasses formed by the explosion, waves of carbon monoxide, that ensured those miners who had escaped the explosion would be suffocated due to lack of oxygen unless they could quickly get to the surface. Rescue teams from places such as Crumlin and Aberdare were rushed to the scene but attempts at getting the men out were hampered by fallen debris, by a series of roof falls and by raging fires. One of the rescuers was caught and killed in one of these roof falls but, regardless of the cost, the men worked on. And they did manage to find men and boys still alive in the wreckage, the families of the Senghenydd miners greeting each successful escape with joy and with the belief that their own loved ones would soon be brought to the surface. However, as the days wore on, survivors grew fewer and the carrying out of bodies became the norm. The rescue attempts lasted for three weeks although, by then, the chances of finding anyone alive had long since gone. Some of the bodies had been so badly mutilated in the explosion that they could only be identified by certain items of clothing they were wearing. One man was recognised by his new boots, worn for the first time that day; another – a young boy – by the patch his mother had sewn onto his jacket only a few days before. It was estimated that over 1,000 people in the area were bereaved by the Senghenydd disaster. Certainly nearly all of the families in the town were touched, in one way or another. And yet, despite the resulting enquiry finding numerous faults that could be laid at the door of the owners and managers, when compensation and fines were levied they came to a derisive £24 – in total! As one newspaper commented, that meant that miners lives were worth just ‘£0 1s 1 1/4d’ – a sum that, these days, would equate to no more than six pence. Universal Colliery was back in use by the end of November 1913 and full production was again achieved by 1916. The mine was not to last much longer, however, workmen and staff being given just one day’s notice of closure in March 1928. Although the site was later acquired by Powell Duffryn in order to give extra ventilation to their Windsor Colliery, the Senghenydd shaft was finally filled in 1979. There are several memorials to the men and boys who lost their lives at Senghenydd, one at Nant y Parc Primary School which now stands on the site of the mine. There is another at the local comprehensive. But the real tragedy of Senghenydd does not lie in just the 1913 disaster. Proving that the old adage “lightning does not strike twice in the same place” is a mere fallacy, twelve years earlier, on Friday 24 May 1901, the same colliery had experienced its first disaster. At 5.00am on that day an explosion decimated the mine and killed 81 men. There was just one survivor pulled from the mine shaft. 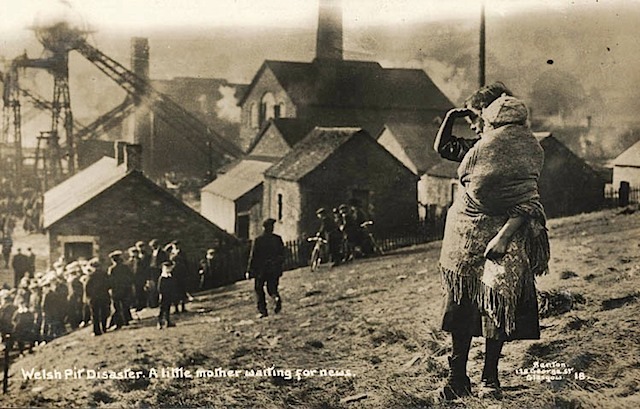 The history of Wales and its industrial past is full of tragedy, human grief and loss. But none of the disasters that have befallen the country are worse than the Senghenydd mining disaster when tragedy struck the same village and the same community, not once but twice within the space of a dozen years. Listen to an interview with William Vizard, ex-miner who survived the Senghenydd pit disaster in 1913. This article originally appeared on the BBC Wales History blog, and is reproduced here with kind permission.